This compact mobile accessory for your vehicle boasts multiple functions. Can it live up to its claims? The unit itself is small, yet sturdy, and can easily be kept in the trunk of the car. It's easy to charge and has two USB ports for charging mobile devices. The unit charged fully in the advertised 3 hours. The included hoses connect easily to the unit and it is simple to use right out of the box. There is not an included carrying case for all of the accessories. The collapsible bucket from the video is apparently an add-on feature. The instructions are not in English. The included hoses and jumper cables are a bit short. Norshire is a simple to use and easy to bring along unit that can assist with keeping your car clean, as well as your devices charged. It would be especially useful for those living in an apartment/condo or for anyone who travels frequently because it does not require a water hose and it easily stores right in the car. The unit price of $219 is reasonable considering the multiple functions built into this small vehicle accessory. The size, shape, weight and portability of the unit are great. Areas that can use some improvement include the length of the included hoses and the plastic connector. And again, we want to ensure that the entire unit is watertight so as to withstand prolonged usage after multiple washings. It would also be helpful to have some instruction included as to water remaining inside the unit after it has been turned off and the hoses disconnected, as that water does get expelled later when the power button is pressed to check the battery, or charge portable devices. The warning sign function is a bit of a stretch. It is small and not easily seen when placed on the ground. It also has no lights for nighttime use and can easily roll due to the shape of the unit. It is easy to setup and start using the washer function, however the accompanying hose is not quite long enough, creating the need to move the unit and water bucket around while washing the car. Having two spray nozzles for different levels of water pressure is nice, as is the brush with soap dispenser. Having the peace of mind of being able to charge up any of your devices, as well as jump start the car in a pinch is a definite plus. Although there were no written instructions in English, it was very easy to use the unit straight out of the box. The built in voice assistant and speaker allow for quick battery status updates and a couple of simple instructions. The connections for both water and charging were self explanatory, as were the components themselves for washing the car. The main unit is lightweight but still sturdy. The compact design is easy to carry and store inside the car as long as it is charged up ahead of time. The nozzles are metal and good quality. It's nice to have the attached quick connections, one of which is metal and sturdy while the other is plastic and we are unsure how it will hold up over time. The speaker and voice assistance are clear and concise and keep you informed as to the current battery level and some simple instructions. It is questionable as to the level of water resistance the unit maintains, as far as the electrical components are concerned. Although the internal portion where the water flows from hose-to-hose appears to be fully contained, the plastic housing over the speaker and around the charging ports does not appear to be watertight. With this unit having enough power for a jump start, we made sure to keep it from being splashed while it was being used to wash the car, as a precaution. Norshire boasts being a 4-in-1 utility kit that has everything you need to keep your car clean and safe. It combines a car washing kit, jump starter, warning sign and power bank in one portable device. Although we were not able to test the jump starter functionality, the washing kit and power bank functions both worked very well. It was simple to submerge the siphon into a bucket of water and rinse the car with the spray nozzles. The brush and soap dispenser also worked very well. If we are able to utilize the jump start feature in the future, we will provide an update to this review. The unit weighs only a couple of pounds. It is easy to carry and move around while taking up little space. 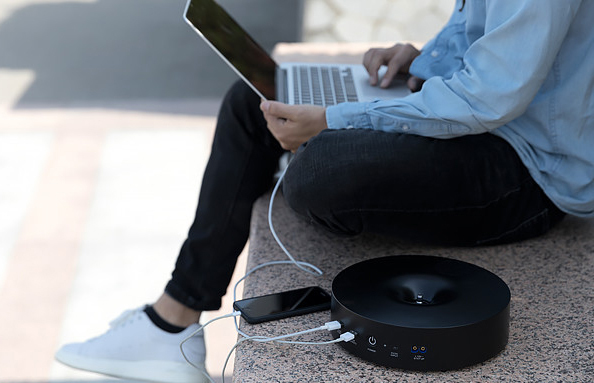 It is easy to charge any brand cell phone, tablet, laptop or camera with the onboard USB ports and having two of them is nice for any road trip. The unit does not require any type of internet or Bluetooth connection. It was fully charged right out of the box and voice assistant is easy to understand. All components are easy to connect and it was only a couple of minutes from box to usage.